Victoria, Mahe (Seychelles) – June 26, 2018 (travelindex.com) – Seychelles became an independent republic within the Commonwealth on June 29, 1976. The newly knighted Sir James Mancham became the country’s first President, with Albert René as Prime Minister. The independence negotiations with Great Britain also restored the islands of Aldabra, Farquhar and Desroches, which had been transferred from Seychelles in November 1965 to form part of the new British Indian Ocean Territory (BIOT), to Seychelles upon independence. In our Saint Ange Tourism Report edition #21 of the 28th May, we announced the appointment of US Citizen Charles Johnson as the new Chief Commercial Officer for Air Seychelles. Extract of the article:- “Finally, it has now transpired that following the series of redundancies implemented by the Seychelles National Airline, the post of Chief Commercial Officer, previously occupied by Seychellois, will now be filled effective 1st June by a US Citizen, Charles Johnson from the budget airline, Hong Kong Express. This is reported in aviation tips and yet in Seychelles the news is yet to be made public”. Today it is official and Air Seychelles has confirmed the appointment. Staff at Air Seychelles and some from the local printed newspapers had been in touch with us ever since the article appeared on the 28th May to see if the appointment of Charles Johnson was true. Coco de Mer will be exported – Any direct benefit for the Praslinois? Seychelles will start re-exporting the coco de mer kernel after confirming that the licensed exporters will ‘develop value added ideas’ to the unique Seychelles product. In September 2014 many questioned the idea of making Praslin and the Praslinois benefit from their own national treasure. Do we need to only export the kernel or should we maximise the usage of what is agreed to be exported? After the 2014 Praslin Culinary & Arts Fiesta, many agreed that Seychelles needed to firstly, plant more of its unique national treasure, and secondly, the kernel of the nut destined for export should be processed here in Seychelles and preferably on Praslin Island itself. The Seychelles News Agency carried a Headline to one of its articles as:- “A taste of the forbidden fruit – Seychelles coco de mer at the centre of Praslin’s first culinary and arts fiesta” . Everyone wants to protect the unique Coco de Mer of Seychelles and the protection cannot be through exportation. It was suggested in 2014 that a Cooporative to process the coco de mer kernel needed to be set up on Praslin with the accredited exporters and Praslin residents. The Cooporative should be the only institution licensed to trade in this protected nut and it could develop products that could benefit the tourism industry of Praslin and even export where possible with the numbered official label ‘Seychelles Coco de Mer’. Ice cream could be a product that would be sought after as well as other products such as biscuits, bread etc. This would provide employment to Praslinois and develop a trade that will keep Praslin visible. The coco de mer powder, flakes and oil that can today be purchased online could also be done in that same Cooporative on Praslin. The quota of these endangered nuts allocated for export should instead be transferred to the Praslin coco de mer Cooporative. This unique nut is for Seychelles and our islands should be the only ones exploiting it for the benefit of the Seychellois and Seychelles. The Tourism Board of Seychelles and the Ministry responsible for Tourism recently published a walks and trail brochure encouraging visitors to Seychelles to discover more of the islands. But are we ready for such a drive that will see more visitors on our trails and walks? The Copolia Trail has become more popular in recent years and many letters received complement this great unique selling point of Seychelles, but the letters also speak of the need to develop these attractions to suit what Seychelles says it is… an upmarket tourism destination with a yield from tourism that continues to make this industry the pillar of its economy. One of the many proposals being aired, is the need for a small welcome centre, where the security officers on duty have a cover over their heads when it rains, and a toilet facility instead of seeing visitors caught reluctantly having to hide behind trees for a needed relief. The welcome centre shed could also have a framed poster of the walk and the various attractions that can be found along the way. The start of this Copolia Trail also has a spectacular viewing point, which can house adequate parking as well as photo opportunities. These are but small concerns for a great outing that enhances a Seychelles holiday. The same can be said for the La Misere Road viewing spot and other such points of exceptional beauty where tourists and Seychellois gather to admire the natural beauty of Seychelles. A thirteen member Advisory Board has been appointed for the non-profit organisation “Helping Needy Welfare Society of India” and I was honoured this month to have been named a member of that Board and appreciate the confidence being placed in me. Working beyond one’s own border shows the respect and recognition by the world for one’s ability and seriousness. 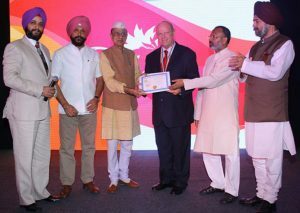 In August 2014 as the then Seychelles Minister for Tourism and Culture, I was decorated with the Mahatma Gandhi Samma Award at a ceremony at the Le Meriden at Connaught place in New Delhi by Dr Bhishma Narain Singh, a former cabinet Minister of the government of India and Governor of Assam, Meghalaya, Tamil Nadu who said as he presented the Mahatma Gandhi Award, that Indo-Seychelles relations have been characterised by close friendship, understanding and cooperation. Turkish Airlines has started flying to Moroni in the Comoros, via the Seychelles effective the 18th June. With no 5th ‘Freedom rights’ issued to Turkish Airline, means that if a Seychellois needed to get to Comoros, he cannot board the two hour or so flight going directly to Comoros, but will instead need to fly to Kenya to connect after a night in Nairobi. The same for tourists wanting to use Seychelles as a base for a two or three island stop in the Vanilla Islands. Air Seychelles is not flying to Comoros and we are still protecting what is not existing at the detriment of the Seychelles tourism industry and the interests of the people of Seychelles. This is a reluctance by Seychelles to implement the Open Sky principle under the Single African Air Transport Market (SAATM) which was signed earlier this year. The denial of this link with the Comoros is against the African Union (AU) resolution signed in Addis Ababa in January 2018 which aims to enhance connectivity, facilitate trade and tourism and create employment. The timing of the announcement by President Danny Faure that he is not forwarding the proposition for the construction of the Indian Military Base of Assumption, came but weeks before the Seychelles Independence Celebrations. The Seychelles Independence in 1976 was marked with the return of the islands of Aldabra, Farquhar and Desroches, which had been transferred from Seychelles in November 1965 to form part of the new British Indian Ocean Territory (BIOT). Today, Seychelles are breathing a sigh of relief realising that the peaceful protest campaigns in Victoria, led by the committee under the chairmanship of Terry Sandapin, was heard by the National Assembly and they in turn said that the Assumption Deal was ‘dead’.